So, one billion people live in countries that are dirt poor. One billion! 1 000 000 000! The really strange thing is that global poverty is falling, except for in the poorest states (50) where the opposite is the case. Some of these countries, like Malawi, have always been at the bottom but others, like Sierra Leone, have only recently arrived there. 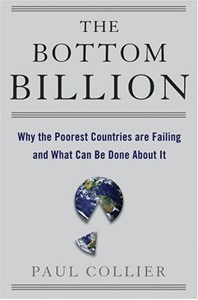 What are the possible causes of some countries staying at the bottom? What, if anything, can be done to change that? To get to those answers Collier looks at countries plagued by civil war, countries without natural resources, countries that have bad neighbors, poorly governed countries and latecomers to the international market. This book is well worth reading. It certainly changed my way of thinking of the countries that are stuck in such terrible poverty. All I had to do (extremely difficult for me) is keep in mind that statistics are open to interpretation. Sounds like a really important book. I hope it gets read widely. It helped me think different thoughts about the whys and whereofs of poverty.